Following the establishment of Holy Trinity Roman Catholic Church in Niagara Falls in 1902, Polish clubs and organizations began to quickly flourish in the Cataract City’s Polonia. One of the first groups to form within the parish was the mixed voice chorus of the Lutnia Singing Society, establishing itself on April 29, 1905. Outside of the church, the Polish Falcons made a big push to recruit members in the city, and on March 8, 1906 a nest was formed in Niagara Falls. While the two groups prospered in their early years, by the 1920s they began to struggle. To continue their missions of preserving Polish culture, the Lutnias and Falcons banded together and on March 12, 1922 formed the Echo Society with Konstanty Crzybowski, Salomea Kobierny, and Matthew, Walter, and Benedict Kaszyca, being amongst the charter members. Formed out of two organizations, the Echo Club started out with a sizable membership and used the former Falcons’ nest at Cudaback and 19th Street as their home. 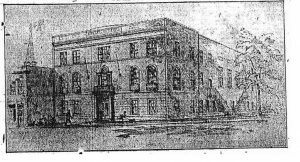 The first year saw tremendous growth for the society and in June 1923 they purchased a lot near Portage Road and East Falls Street. 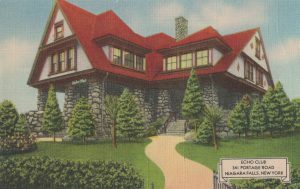 Under the leadership of Stanley Niewiadomski, Frank J. Pietak, Dr. J. J. Nicholaus, and Dr. Leo Rozan, the club hired architect Simon Larke who planned a three- story brick building with offices, a bowling alley, billiard room, parlors, reception room, and full bathing facilities all costing around $60,000. While the society was fundraising for their new building, Niagara Falls’s Polonia lost one of its leading men Alexander Zaleski. Since the Zaleski family no longer needed the large homestead they sold their building to the society and on November 1, 1931 the new clubhouse at 341 Portage was formally opened. The society began to remodel and add on to their new home right away. In the first four years a billiard room, radio room, and library were added to the facility. There was also ample space for the singers to perform and practice under the leadership of Louis Zaidel as they competed within the Polish Singers Alliance. By 1938, William Stempien was the club president, Louis Zaldel and Frank Oliwiecki were vice presidents, and Joseph Madej was treasurer. Around the same time the Echo Club began holding a joint Swieconka and Dyngus Day party celebrating the end of Lenten season. Through the Depression the Echo held parties, dances, concerts, and fundraisers all to pay their building off, and on November 25, 1942 the club burned the mortgage, celebrating their freedom from debt. As part of the festivities former president and proponent of purchasing 341, Sigismund Lopacki, reiterated the aims of the club while Anthony Snaglewski gave a brief history of the society. Besides raising money to pay off the mortgage, the ladies of the society raised over $435,000 in bond sales in support of the war effort. In 1952 the club was remodeled again and a special dance was held as part of the society’s thirtieth anniversary. By that time the mixed choir had 65 members and the Echo Society was considered the primer Polish organization of Niagara Falls. Ten years later the membership was at 500, but the choir under the direction of Michael Slominski was down to 50. The club would see this steady decline continue over the next 50 years. 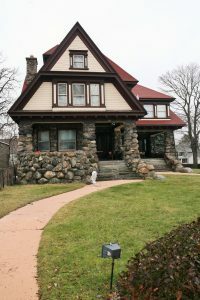 The society would marshal on, continuing to uphold Polish culture and traditions until 2008 when they sold 341 Portage. Since then the building has been redeveloped into an event center. "100 Years of 'Echoing' Memories." Am-Pol Eagle [Cheektowaga, NY] 14 Sept. 1995: 2. Print. "Anniversary Speaker Traces Objectives of Echo Club." Niagara Falls Gazette [Niagara Falls, NY] 29 Sept. 1963: 3-C. Print. "A Peep Into the Past." Niagara Falls Gazette [Niagara Falls, NY] 29 Oct. 1938: 6. Print. "Banquet Observes Society Birthday." Niagara Falls Gazette [Niagara Falls, NY] 23 Nov. 1937: 7. Print. "Campaign on to Raise $60,000 for New Echo Home on Portage Road: Bonds Now Being Sold." Niagara Falls Gazette [Niagara Falls, NY] 2 June 1925: 11. Print. "Construction Value of One Week's Building Permits Totals $63,340." Niagara Falls Gazette [Niagara Falls, NY] 19 July 1927: 18. Print. "Echo Club Buys New Home Site To Erect Club House." Niagara Falls Gazette [Niagara Falls, NY] 29 June 1923: 13. Print. "Echo Club Is 50 Years Old." Niagara Falls Gazette [Niagara Falls, NY] 12 Mar. 1972: 1-B. Print. "Echo Club to Install." Niagara Falls Gazette [Niagara Falls, NY] 15 Jan. 1937: 11. Print. "Echo Group Plans Anniversary Rite, Opening of Rooms." Niagara Falls Gazette [Niagara Falls, NY] 12 Nov. 1952: 16. Print. "Echo Society "at Home" Here Tomorrow." Niagara Falls Gazette [Niagara Falls, NY] 31 Oct. 1931: 4. Print. "Echo Society Banquet." Niagara Falls Gazette [Niagara Falls, NY] 24 Feb. 1925: 4. Print. "Echo Society Is Free From Debt; Burns Mortgage." Niagara Falls Gazette [Niagara Falls, NY] 28 Nov. 1942: 20. Print. "Echo Society to Celebrate 100th Anniversary of Niagara Falls Headquarters." Am-Pol Eagle [Cheektowaga, NY] 7 Sept. 1995: 1+. Print. "Echo Society To Celebrate Its 40th Year." Niagara Falls Gazette [Niagara Falls, NY] 28 Feb. 1962: 42. Print. "Enlarged Quarters of Falls Echo Club Are Formally Opened." Niagara Falls Gazette [Niagara Falls, NY] 7 Jan. 1935: 4. Print. "Falcons Plan to Build Home." Niagara Falls Gazette [Niagara Falls, NY] 26 May 1910: 6. Print. "History of Echo Club Subject of Upcoming Heritage Meeting." Ampoleagle.com. Am-Pol Eagle Newspaper, n.d. Web. 14 Mar. 2017. "Miss Ficner Heads Echo Club Festival." Niagara Falls Gazette [Niagara Falls, NY] 9 Apr. 1953: 16. Print. Miller, Virginia. "250 at Celebration Marking Echo Club's 40th Anniversary." Niagara Falls Gazette [Niagara Falls, NY] 4 Mar. 1962: 1-C. Print. "Organizations." Niagara Falls Gazette [Niagara Falls, NY] 6 Apr. 1939: 26. Print. "Polish Colony to Hold Big Celebration Sunday." Niagara Falls Gazette [Niagara Falls, NY] 3 May 1913: 1. Print. "Polish Swieconka." Niagara Falls Gazette [Niagara Falls, NY] 21 Apr. 1936: 8. Print. "Rites Tomorrow For Louis Zaidel Chorus Leader." Niagara Falls Gazette [Niagara Falls, NY] 17 Dec. 1951: 12. Print.